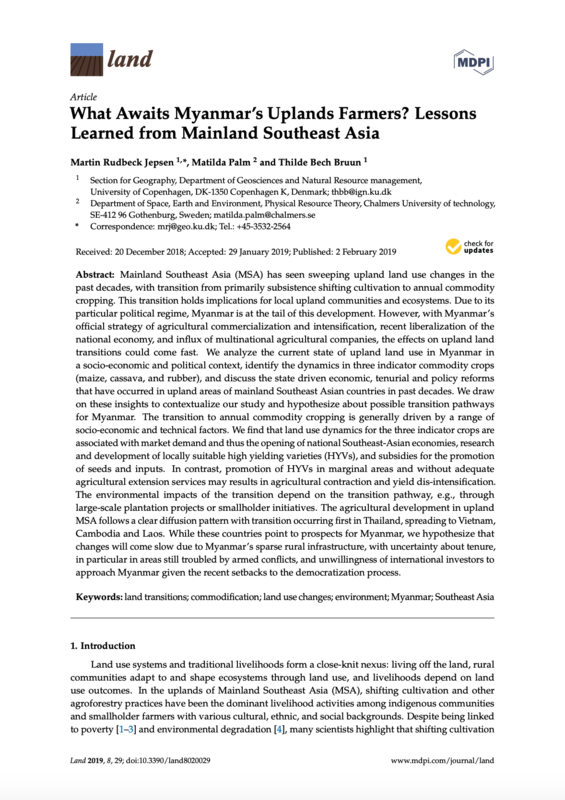 Mainland Southeast Asia (MSA) has seen sweeping upland land use changes in the past decades, with transition from primarily subsistence shifting cultivation to annual commodity cropping. This transition holds implications for local upland communities and ecosystems. Due to its particular political regime, Myanmar is at the tail of this development. However, with Myanmar’s official strategy of agricultural commercialization and intensification, recent liberalization of the national economy, and influx of multinational agricultural companies, the effects on upland land transitions could come fast. We analyze the current state of upland land use in Myanmar in a socio-economic and political context, identify the dynamics in three indicator commodity crops (maize, cassava, and rubber), and discuss the state driven economic, tenurial and policy reforms that have occurred in upland areas of mainland Southeast Asian countries in past decades. We draw on these insights to contextualize our study and hypothesize about possible transition pathways for Myanmar. The transition to annual commodity cropping is generally driven by a range of socio-economic and technical factors. We find that land use dynamics for the three indicator crops are associated with market demand and thus the opening of national Southeast-Asian economies, research and development of locally suitable high yielding varieties (HYVs), and subsidies for the promotion of seeds and inputs. In contrast, promotion of HYVs in marginal areas and without adequate agricultural extension services may results in agricultural contraction and yield dis-intensification. The environmental impacts of the transition depend on the transition pathway, e.g., through large-scale plantation projects or smallholder initiatives. The agricultural development in upland MSA follows a clear diffusion pattern with transition occurring first in Thailand, spreading to Vietnam, Cambodia and Laos. While these countries point to prospects for Myanmar, we hypothesize that changes will come slow due to Myanmar’s sparse rural infrastructure, with uncertainty about tenure, in particular in areas still troubled by armed conflicts, and unwillingness of international investors to approach Myanmar given the recent setbacks to the democratization process.